The ROEQ TR500 Top Roller was developed to support heavy internal logistics in industrial facilities. The basic functionality of the TR500 is to perform automated load and unload operations. Its design enables safe and reliable transportation of goods, with varying footprints. With a TR500, the MiR500 is able to carry out scheduled pick-up and delivery tasks, with many different types of heavy goods. The piCOMPACT®23 SMART is an IO-Link-ready vacuum generator platform. A generic input/output (IO) communication technology, IO-Link provides point-to-point links between sensors and actuators. It can be used with any type of fieldbus, enabling users to easily link together different systems within a plant. The new SMART generation of piCOMPACT®23 is ready to utilize and take full advantage of the benefits offered by an information-rich and connected Industry 4.0 future. 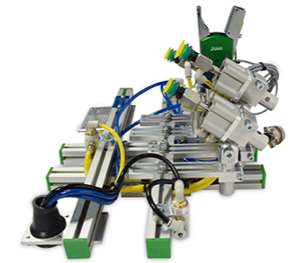 Configurable vacuum ejector based on COAX® technology with integrated controls, developed for robotic handling applications. Optimized design for high reliability, flexibility, high vacuum flow and fast cycle times. piCOMPACT®23 SMART to be selected for medium or larger vacuum systems, such as palletizing of boxes and loading, sorting, transfer and unloading of different sheet materials. Available sensor data; temperature, voltage, acceleration, cycle analysis and more, to help predict maintenance. 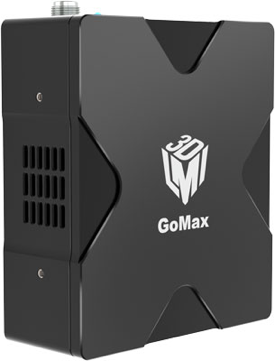 The new LMI GoMax® provides a dedicated hardware solution to accelerate any Gocator® by adding massive GPU-driven data processing power to the sensor (or sensor network)—without the need for an industrial PC. Capturing exceptionally detailed, high-resolution 12 MP images, the new Cognex In-Sight 9912 delivers high accuracy part location, measurement, and inspection over a large area—even when mounted at longer distances. With its all-in-one, IP67-ready form factor and easy-to-use EasyBuilder interface, the 9912 is more cost effective and easier to integrate than most controller- or PC-based vision systems. The In-Sight 9000 series offers both area scan and line scan image capture options. Piab is introducing a new line of robotic End-Of-Arm Tooling (EOAT) products, enabling customers to build automated systems that perfectly fit their specific applications. Piab’s complete set of off-the-shelf standard components can be used to solve the real automation challenges facing manufacturers. Made up of several different families of components, the new EOAT line offers standard products in a broad range of sizes and dimensions, resulting in a modular automation technology set comprising an impressive 600 different pieces of equipment. 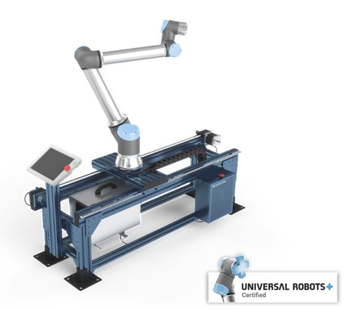 We are excited to announce that Vention's modular, customizable 7th axis range extender has received official Universal Robots Plus certification. Vention’s 7th axis extends the range of any Universal Robots and can be easily customized to your needs in terms of length, height and mounting orientation. It connects seamlessly with the Universal Robots controller. Users can entirely program their range extender directly from the UR teach pendant, leveraging Vention’s URCap for linear motion.